An instant messenger online contact picture frame. A DIY instant messenger online contact signalizer picture frame thingy. Don't want to get off the couch to se who's online on Skype og MSN? Me neither! Let's start with the picture frame itself. I desided to make a picture frame to support five small passport sized portraits. I made a base in hardwood with two long grooves in which some sheets of polycarbonate could be inserted. I used a metal working mill to cut the grooves but a hand-held wood router should make just as fine cuts. After cutting the rooves, I drilled five holes in the first groove to support the LED's that will illuminate the photos. The first polycarbonate sheet was cut into five individual pieces and sanded down on the sides. This will make it possible to get the individual pieces to glow when the LED's are turned on and off, and the sanding will help scatter the light within the polycarbonate. Finally the rear piece of polycarbonate was sandblasted just for the looks. Now let's take a look at the controller board. A Long Time Ago on a Desktop Far Far Away, I made a test-board for the PIC18f2220, with RS232 communications, and an LED on each of the remaining pins on the microcontroller. I just reused that board in my picture frame project. 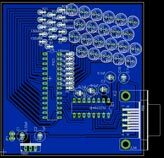 The cool thing about this board is that it will allow you to build your own picture frame with up to 22 LED's. As I wrote earlier, I've misplaced all the source code for this project, so it's up to you to do the coding. If I some day find the time to rewrite the software, I'll do so and add the code to this article. I don't see this happen any time soon though, as I'm the type of guy that prefer to start a new project than finalizing the old ones. That's all for now on this project. Thank you for reading!